"As the wind blows the snow around outside, and ice covers the world, humans retreat into warm places by their fires, under blankets made of wool, while animals outside use fallen leaves as blankets. Some hibernate in groups, their breathing slowing down huddled together in a furry pile, and as for us humans, we grab a cup of tea or hot chocolate with marshmallows, put on wool socks or sheepskin slippers, comfy sweaters and blankets, and enjoy the feeling of warmth, coziness, that is the sweetest when you know there is bone chilling cold outside. Think flames, ember and ashes, think wool, fleece and fur, warm things for the tummy and warm things for the soul. 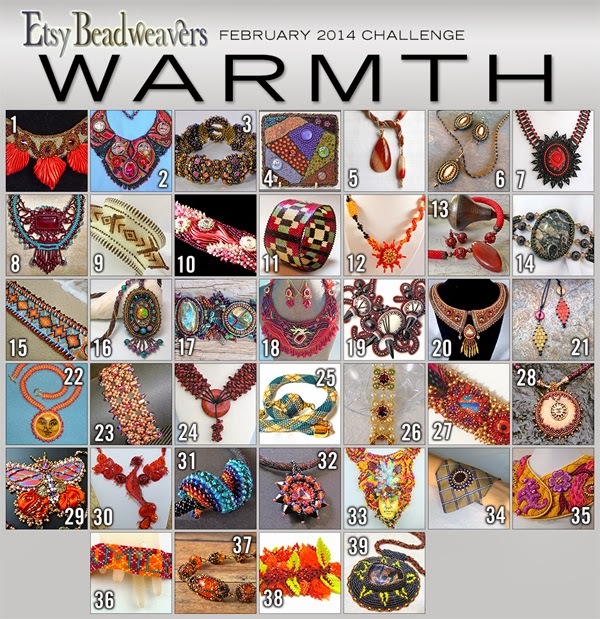 Think of whatever it is that makes you feel warm on a long February night, and turn it into a cozy warm beaded piece." As usual there is time until the 16th to vote for your favorite on our team's blog!